Only fully liberated in July 2017, half of the city is severely damaged while weak rule of law allows ample opportunities for a range of armed actors to intervene in Iraq’s second largest city. 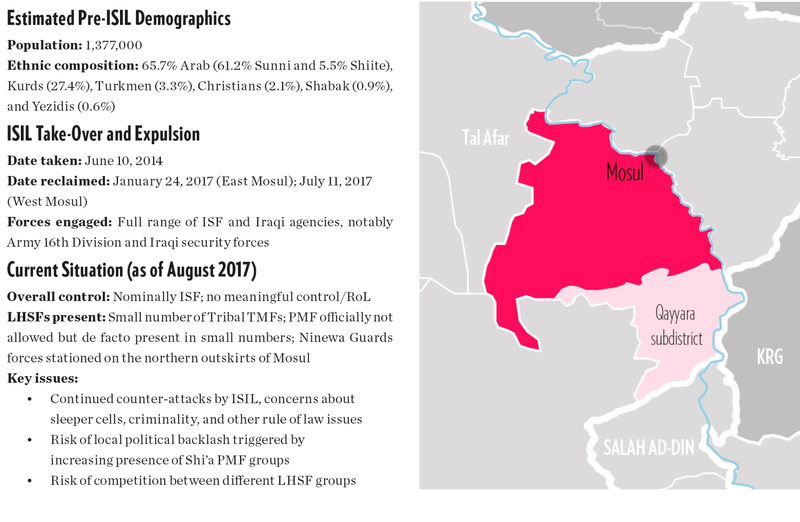 At the time of research in February and March 2017, Mosul was divided. West Mosul was still under ISIL control, but Coalition operations to retake it had just commenced. East Mosul had recently been liberated in January 2017. However, the security environment was still volatile, and rule of law was not fully restored. However, although Shi’a PMF forces had no formal role in Mosul, there were frequent reports of their presence inside the city and significant opportunities for some of the larger southern PMF groups to influence the situation through control of local PMF groups affiliated with them. With the stakes much higher for the Iraqi state to control Mosul, it will be important to observe how much more closely these LHSF groups (local, regional, and national) are controlled and dealt with. Iraq’s second or third largest city (estimates vary), Mosul has a total estimated population of 1,377,000.4 Although significantly altered by the events in the last three years, Mosul’s demographics prior to ISIL’s capture were predominantly Sunni Arab (over 60%), with a substantial Kurdish minority (roughly 25%) and smaller numbers of Shi’a Arabs, Turkmen, Shabak, and Christians.5 Mosul is divided by the Tigris River, and this division creates different dynamics on the east and west sides.6 The much longer occupation of West Mosul and the higher scale of damage incurred during the liberation of West Mosul, are also likely to create substantially different reconstruction and return patterns in West Mosul in the future. How a group of an estimated 1,500 to 2,000 fighters10 was able to claim one of Iraq’s major cities, formerly a bastion of Saddam’s military and political power, is a point of controversy.11 Many have blamed Iraqi forces’ failure to defend Mosul on then Governor of Mosul Atheel al-Nujaifi. The Iraqi government removed him from power in May 2015 over these allegations, and the Iraqi Federal Court issued a warrant for his arrest in October 2016. The capture of Mosul by ISIL spurred high levels of displacement, but the majority of the population remained. Reports indicate that in the first week of the ISIL advance into Mosul, close to 500,000 of the city’s inhabitants fled16 but about 70% of the population remained.17 The governorate’s largest city and capital, Mosul’s capture also created significant ripple effects for other areas across the governorate, officially disbanding any governorate-wide administration that had been centered in the city (for an illustration see the description of the effects in the Rabi’a and Zummar research summaries in this series). The operation to liberate Mosul (dubbed ​“We are coming, Ninewa”) began in October 2016. Given the political and ideological significance of its capture (and the way this defeat had tarnished the ISF’s image) and past misconduct by PMF forces in other Sunni-dominated areas, Prime Minister Abadi was very clear that Iraqi forces would be responsible for retaking Mosul. Ground efforts to liberate Mosul involved no less than six different ISF forces or agencies, according to RISE’s research; the Army’s 16th Division took overall operational command, and the Counter-Terrorism Service (Iraq’s special forces) led some of the most significant fighting (as in much of the Ninewa operations).19 East Mosul was declared liberated on January 24, 2017, but it would take another four months of harsh, neighborhood-by-neighborhood, and street-by-street fighting to clear West Mosul. West Mosul was declared to be officially in government control on July 11, 2017. ISIL fighters forcibly prevented many civilians from fleeing during the offensive, and many were also trapped in their homes because of the danger of crossing the frontlines. Despite these significant obstacles, an estimated 800,000 people fled Mosul between October 2016 and June 2017, according to RISE’s report.26 Although RISE’s analysis also noted that many residents had returned quickly to Mosul, some within a week or two, return may take much longer for the West Mosul population given the significant amount of destruction. The front gate of Mosul University, with the destroyed remains of the main campus behind it, as seen in February 2017. In East Mosul, airstrikes, ground operations, and ISIL’s sabotage of buildings also created significant damage. For example, Mosul University and the area around it was almost totally destroyed. There was also some looting and damage perpetrated by parts of the liberating forces, although opinions varied as to who was involved. Some local civilian and military officials interviewed speculated that it was a combination of Federal Police, PMF forces, and other criminal armed groups. The level of other government service provision was similarly low, with one senior official in the governor’s office stating (in an interview for this study) that of the roughly 3,000 people nominally assigned to his office, he doubted that more than 100 were actually working. Overall the governorate leadership and provincial council were known to be weak, and there were significant corruption allegations. It is worth emphasizing that the decimated government functions and services had a significant impact not only on the people of Mosul but across the governorate. When ISIL decapitated any governorate-level administration, it significantly cut the ability of other areas in the government to maintain services as normal, including the regular administration of services and the law in connection with government authorities in Baghdad. With these central governorate functions still not recovered well into 2017, it has been difficult for other areas of Ninewa, even those that have been liberated for over a year, to re-establish full civilian governorate control, as highlighted in areas like Rabi’a, and Zummar. The level of LHSF engagement in Mosul, as with everything at the time, was still in a state of flux at the time of writing. At the time of the site visits and primary field research, East Mosul was under the predominant control of the Federal Police and ISF – including Special Forces – supported by a handful of Tribal Mobilization Forces (the Coalition-trained Sunni tribal part of the PMF). However, the level of control was weak; these forces manned a limited number of checkpoints throughout the city, and these checkpoints were far more spread out and far less visible or frequent than in places like Qayarra or the road from Erbil into Qaraqosh. The wreckage of burned out cars, likely used as suicide car bombs, litters the damaged streets in Mosul, as seen in February 2017. Officially PMF forces are not present in Mosul, and had no role in either the liberation or holding of Mosul, but unofficially they have been engaged in both – most frequently through ad hoc cooperation with other ISF actors or through local PMF groups loyal to them. Given past reports of misconduct by PMF in places like Falluja and Ramadi35 and the backlash such abuses created among Sunni populations, there was a deliberate decision to keep the main Shi’a PMF out of Mosul.36 This was repeatedly reinforced in statements by government officials going up to Prime Minister Abadi himself. As an official matter, PMF had no role in the main fighting to retake Mosul and were not given roles at checkpoints or providing other security inside Mosul, as areas were subsequently liberated. However, even if the PMF were officially kept out of Mosul, interviews with military leaders, Mosul officials and community leaders suggested that PMF forces have been unofficially present and influential at each stage of operations.37 While PMF forces were not prominent in the main fighting to take Mosul, Shi’a Hashd forces were involved in taking surrounding villages nearby, such as Tal Abd to the south, and a significant number have been holding positions outside of Tal Afar, due west of Mosul, since October 2016 (See Tal Afar research summary here). With such close proximity and the general absence of rule of law or tight control in Mosul, access in and out of Mosul was easy for these groups. One local official confirmed that there was such a general lack of control that it was difficult to know for sure which groups were present in East Mosul. The same official suggested that several incidents of kidnapping, violence, and informal control of neighborhoods in East Mosul in February 2017 appeared to be perpetrated by PMF groups, although it was not possible to confirm any single incident. A senior military official confirmed that even though given orders to stay out of Mosul, ultimately the Shi’a Hashd respond to their senior leadership, in particular to Hadr Al-Amri and Abu Mahdi Al-Muhandis, and frequently disregard Iraqi government or military orders on where they should or should not go. A further factor enabling a de facto, unofficial presence of Hashd fighters in Mosul was the porous distinction between the Federal Police and some PMF groups, in particular the Badr Organization. A senior military official within the Ninewa operational command, in an interview for this research, stated, ​“In fact, there is not a big difference between the Federal Police and the PMF because sometimes [when] the PMF are not asked to be part of a battle, they just change their uniform and become a Federal Police.” Key informants for the RISE Foundation report noted the same, attesting that they had seen PMF fighters, specifically Badr, ​“wearing the blue uniforms of the Federal Police and embedded with them.” The same pattern was observed in other research sites in this study, notably in Qayarra. Traditional close linkages between the Federal Police and some PMF, particularly the Badr Organization, led to a blurring of lines between the two forces.38 Individual PMF fighters posted in nearby areas would be called in to make up for manpower shortages at checkpoints or other security postings on an ad hoc, day-to-day basis, and there was often a de facto (but officially discouraged) relationship reported between the Federal Police and PMF on some detention operations. In addition to their close proximity and relationship with Federal Police, PMF also maintained and influence and some degree of control in certain areas in and around Mosul through local PMF forces affiliated with them. PMF-affiliated Shabak militias officially hold checkpoints on the outskirts of Mosul, and have been assigned some limited checkpoint and hold duties in Mosul at different points in the ​“holding” operation. The RISE Foundation also reported that a tribal group recruited from local Sunnis in Mosul, the ​“Mosul Hashd,” was stood up by the Badr organization and Kata’ib Hizb Allah shortly after ISIL took over in the areas.39 RISE reported that they were operating checkpoints in East Mosul and that the group was still under the control of Badr and Kata’ib Hizb Allah. In sum, the close proximity of PMF around Mosul, the presence of these subordinate or proxy forces in the city or on its outskirts, and the weak rule of law and overall control in liberated areas of Mosul created ample opportunities for the informal, but not insignificant, presence of PMF in Mosul at the time of research. Another key group held at arms-length has been the so-called Ninewa Guards Force (also known as Harass Ninewa in Arabic and formerly known as the al-Hashd al-Watani). It was started in 2014 by the former Governor Ateel Nujaifi after the initial ISIL capture of Mosul (although in an interview, the governor claimed it only officially started in 2015), and now comprises some 3,000 forces. Many of the recruits are local Sunni residents from Mosul, former policemen and some former Iraqi Army officers among them, although the force does include smaller numbers of volunteers from other ethnic groups and areas in Ninewa. The Ninewa Guards Force is widely known to be funded and trained by Turkey, although Nujaifi stated in an interview for this study that Turkey only provided them with training and no funding, in consideration for Turkey’s international legal responsibilities. On a site visit to the Ninewa Guards Force camp on the northern outskirts of Mosul, where one of the three brigades is being stationed, researchers observed that, whatever the sources, Nujaifi’s forces appeared better kitted out and resourced than the Iraqi forces at bases visited and were far better equipped than other tribal or local forces. Given how recent the liberation had been at the time of research, it was still too premature to assess the future role of LHSFs in the city and the ways this role would shape political dynamics and local recovery. However, the emergence of multiple, competing groups in and around Mosul, many establishing proxy forces among local actors, was a warning signal for future conflict. Mosul residents interviewed in the course of research – all of whom were Sunni – expressed concern about PMF bases nearby Mosul and about the unofficial activities of PMF in the city. They argued that the PMF were trying to shape the dynamics in Ninewa’s most significant city in advance of elections and feared that they were in a position to do so. Other analysts interviewed argued that the ISF’s performance in Mosul had restored their damaged reputation and undermined the PMF’s position, which would allow local and national Iraqi forces to hold the line on keeping the PMF out of Mosul and limiting their intervention. 1 Mostafa Ahmad Hassan conducted local research. Hana Nasser contributed significant research support and editing. 2 RISE Foundation, Post-ISIS Mosul Context Analysis (Erbil: RISE Foundation, 2017), https://​rise​-foun​da​tion​.org/​s​e​l​e​c​t​e​d​-​r​e​p​orts/. 3 For a more detailed description of some of forces like the PMF, or the Ninewa Guards Force, see the Annex in the Background Literature Review. Erica Gaston, Andras Derzsi-Horvath, Christine van den Toorn, and Sarah Mathieu-Comtois, Backgrounder: Literature Review of Local, Regional or Sub-State Defense Forces in Iraq (Berlin: Global Public Policy Institute and American University of Iraq, Sulaimani Institute of Regional and International Studies, 2017), http://​www​.gppi​.net/​p​u​b​l​i​c​a​t​i​o​n​s​/​p​e​a​c​e​-​s​e​c​u​r​i​t​y​/​a​r​t​i​c​l​e​/​l​i​t​e​r​a​t​u​r​e​-​r​e​v​i​e​w​-​l​o​c​a​l​-​r​e​g​i​o​n​a​l​-​o​r​-​s​u​b​-​s​t​a​t​e​-​d​e​f​e​n​s​e​-​f​o​r​c​e​s​-​i​n​-​iraq/. 4 UN Habitat, City Profile, 21. 5 Given the lack of recent census data, it is difficult to find accurate data on the ethnic composition of Mosul. For a more detailed description of these estimates, see Ibid., 21; Knights, How to Secure, 6. 6 UN Habitat, City Profile, 77. As of 2017, the population of East Mosul is approximately 400,000. From 1990 to 2003, the east underwent many demographic changes. Prior to 1990, about two-thirds of all Mosul city residents lived on the river’s right bank, in West Mosul. However, due to the Iraq-Kuwait war, residents began migrating to East Mosul, which led to the urbanization of the area. Many of Mosul’s minority populations are clustered in East Mosul. 7 ​“Sunni Rebels Declare New ​‘Islamic Caliphate´,’’ Al-Jazeera, June 30, 2014, http://​www​.aljazeera​.com/​n​e​w​s​/​m​i​d​d​l​e​e​a​s​t​/​2​0​1​4​/​0​6​/​i​s​i​l​-​d​e​c​l​a​r​e​s​-​n​e​w​-​i​s​l​a​m​i​c​-​c​a​l​i​p​h​a​t​e​-​2​0​1​4​6​2​9​1​7​3​2​6​6​6​9​7​4​9​.html; Martin Chulov and Kareem Shaheen, ​“Destroying Great Mosque of al-Nuri is ISIS Declaring Defeat,” Guardian, June 22, 2017, www​.the​guardian​.com/​w​o​r​l​d​/​2​0​1​7​/​j​u​n​/​2​1​/​m​o​s​u​l​s​-​g​r​a​n​d​-​a​l​-​n​o​u​r​i​-​m​o​s​q​u​e​-​b​l​o​w​n​-​u​p​-​b​y​-​i​s​i​s​-​f​i​g​hters. 8 Campbell MacDiarmid, ​“Mosul University after ISIL: Damaged but Defiant,” Al Jazeera, January 26, 2017, http://​www​.aljazeera​.com/​i​n​d​e​p​t​h​/​f​e​a​t​u​r​e​s​/​2​0​1​7​/​0​1​/​m​o​s​u​l​-​u​n​i​v​e​r​s​i​t​y​-​i​s​i​l​-​d​a​m​a​g​e​d​-​d​e​f​i​a​n​t​-​1​7​0​1​2​0​0​9​0​2​0​7​2​7​7​.html. Mosul University is one of the largest universities in the Middle East, with historically among the strongest reputations for academic centers in Iraq. It was destroyed and looted under ISIL; UN Habitat, City Profile, 77. Mosul is also home to several significant, ancient archeological sites, including the Ancient City of Nineveh, Nirgal Palace Gate, and Kuyunijak hill, many of which have also undergone significant damage. 9 Liz Sly and Ahmed Ramadan, ​“Insurgents Seize Iraqi City of Mosul as Security Forces Flee,” Washington Post, June 10, 2014, https://​www​.wash​ing​ton​post​.com/​w​o​r​l​d​/​i​n​s​u​r​g​e​n​t​s​-​s​e​i​z​e​-​i​r​a​q​i​-​c​i​t​y​-​o​f​-​m​o​s​u​l​-​a​s​-​t​r​o​o​p​s​-​f​l​e​e​/​2​0​1​4​/​0​6​/​1​0​/​2​1​0​6​1​e​8​7​-​8​f​c​d​-​4​e​d​3​-​b​c​9​4​-​0​e​3​0​9​a​f​0​a​6​7​4​_​s​t​o​r​y​.​h​t​m​l​?​u​t​m​_​t​e​r​m​=​.​4​8​8​6​4​f​6​3a718. 10 ​“Terror’s New Headquarters,” The Economist, June 14, 2014, https://​www​.econ​o​mist​.com/​n​e​w​s​/​l​e​a​d​e​r​s​/​2​1​6​0​4​1​6​0​-​i​r​a​q​s​-​s​e​c​o​n​d​-​c​i​t​y​-​h​a​s​-​f​a​l​l​e​n​-​g​r​o​u​p​-​w​a​n​t​s​-​c​r​e​a​t​e​-​s​t​a​t​e​-​w​h​i​c​h​-​w​a​g​e​-​jihad; Ned Parker, Isabel Coles and Raheem Salman, ​“Inside the Fall of Mosul,” Reuters, October 14, 2014, http://​www​.pulitzer​.org/​f​i​l​e​s​/​2​0​1​5​/​i​n​t​e​r​n​a​t​i​o​n​a​l​-​r​e​p​o​r​t​i​n​g​/​r​e​u​t​e​r​s​i​s​i​s​/​0​1​r​e​u​t​e​r​s​i​s​i​s​2​0​1​5.pdf. Estimates vary of the number of fighters, particularly as some reports suggest that many Sunni Mosul residents, harassed and persecuted under the Maliki régime and local Shi’a authorities, took up arms and joined the ISIL invaders. 11 Martin Chulov, ​“ISIS Insurgents Seize Control of Iraqi City of Mosul,” Guardian, June 10, 2014, https://​www​.the​guardian​.com/​w​o​r​l​d​/​2​0​1​4​/​j​u​n​/​1​0​/​i​r​a​q​-​s​u​n​n​i​-​i​n​s​u​r​g​e​n​t​s​-​i​s​l​a​m​i​c​-​m​i​l​i​t​a​n​t​s​-​s​e​i​z​e​-​c​o​n​t​r​o​l​-​mosul. 13 Andrew Kramer, ​“Iraqi Military Extends Control in Northern City,” New York Times, June 1, 2008, query​.nytimes​.com/​g​s​t​/​f​u​l​l​p​a​g​e​.html; Department of Defense, Measuring Stability and Security in Iraq (Washington, DC: Department of Defense, 2009). 14 Ned Parker, Isabel Coles, and Raheem Salman, ​“Special Report: How Mosul Fell — An Iraqi General Disputes Baghdad’s Story,” Reuters, October 14, 2014, www​.reuters​.com/​a​r​t​i​c​l​e​/​u​s​-​m​i​d​e​a​s​t​-​c​r​i​s​i​s​-​g​h​a​r​a​w​i​-​s​p​e​c​i​a​l​-​r​e​p​o​r​t​-​i​d​U​S​K​C​N​0​I​3​0​Z​8​2​0​1​41014; Suadad al-Salhy and Tim Arango, ​“Sunni Militants Drive Iraqi Army Out of Mosul,” New York Times, June 10, 2014, https://​www​.nytimes​.com/​2​0​1​4​/​0​6​/​1​1​/​w​o​r​l​d​/​m​i​d​d​l​e​e​a​s​t​/​m​i​l​i​t​a​n​t​s​-​i​n​-​m​o​s​u​l​.html. 16 Tim Arango, ​“Iraqis Who Fled Mosul Say They Prefer Militants to Government,” New York Times, June 12, 2014, https://​www​.nytimes​.com/​2​0​1​4​/​0​6​/​1​3​/​w​o​r​l​d​/​m​i​d​d​l​e​e​a​s​t​/​i​r​a​q​i​s​-​f​l​e​d​-​m​o​s​u​l​-​f​o​r​-​h​o​m​e​-​a​f​t​e​r​-​m​i​l​i​t​a​n​t​-​g​r​o​u​p​-​s​w​a​r​m​e​d​-​t​h​e​-​c​i​t​y​.html. 17 Knights, How to Secure, 13. 18 Fazel Hawramy and Peter Beaumont, ​“Iraqi Kurdish Forces Take Kirkuk as ISIS Sets its Sights on Baghdad,” Guardian, June 12, 2014, www​.the​guardian​.com/​w​o​r​l​d​/​2​0​1​4​/​j​u​n​/​1​2​/​i​r​a​q​-​i​s​i​s​-​k​i​r​k​u​k​-​b​a​g​h​d​a​d​-​k​u​r​d​i​s​h​-​g​o​v​e​r​nment. 19 RISE Foundation, Post-ISIS Mosul. 20 Among the most prominent of these, a US airstrike in March killed an estimated 200 civilians in West Mosul. Human Rights Watch, Iraq: Civilian Casualties Mount in West Mosul (New York: Human Rights Watch, 2017). 21 Amnesty International, Iraq: Battle between US-Led Coalition, Iraqi Forces, and Islamic State Creates Civilian Catastrophe in West Mosul (London: Amnesty International, 2017). Amnesty International criticized Coalition forces for not adapting their fighting techniques to account for the high civilian density in West Mosul. According to AI, the civilian death toll would have been lower had Coalition forces used less powerful and more precise weaponry. 22 Stephen Kalin, ​“Mosul Basic Infrastructure Repair Will Cost Over $1 Billion: UN,” The Wire, June 7, 2017, https://​thewire​.in/​1​5​4​8​5​4​/​m​o​s​u​l​-​i​n​f​r​a​s​t​r​u​c​t​u​r​e​-​r​e​p​a​i​r​-​b​i​l​l​i​o​n-un/. 23 BBC Global News (Radio), ​“Iraq PM formally declares Mosul victory,” July 10, 2017. 25 Tim Arango and Michael R. Gordon, ​“Iraqi Prime Minister Arrives in Mosul to Declare Victory over ISIS,” New York Times, July 9, 2017, https://​www​.nytimes​.com/​2​0​1​7​/​0​7​/​0​9​/​w​o​r​l​d​/​m​i​d​d​l​e​e​a​s​t​/​m​o​s​u​l​-​i​s​i​s​-​l​i​b​e​r​a​t​e​d​.html. 26 RISE Foundation, Post-ISIS Mosul, 2. 27 When visited during the field research in March 2017, East Mosul had comparatively less damage than areas visited in Bartella and in Qaraqosh. 28 After the liberation of East Mosul, reports indicate that life mostly returned to normal. Vendors returned to their shops, and schools and universities were reopened; see ​“Lipstick and Dresses Return to Mosul’s Streets,” BBC, May 22, 2017, http://​www​.bbc​.com/​n​e​w​s​/​w​o​r​l​d​-​m​i​d​d​l​e​-​e​a​s​t​-​3​9​5​25749; Alice Fordham, ​“Life Inches Back to Normal in East Mosul, but Worries Remain,” NPR, February 18, 2017, http://​www​.npr​.org/​s​e​c​t​i​o​n​s​/​p​a​r​a​l​l​e​l​s​/​2​0​1​7​/​0​2​/​1​8​/​5​1​5​8​2​3​1​4​6​/​l​i​f​e​-​i​n​c​h​e​s​-​b​a​c​k​-​t​o​-​n​o​r​m​a​l​-​i​n​-​e​a​s​t​-​m​o​s​u​l​-​b​u​t​-​w​o​r​r​i​e​s​-​r​emain. Tens of thousands of those displaced from East Mosul returned to the area in early February 2017; see Dilshad Abdullah, ​“Displaced Iraqis Leave Camps as Smoke Clears in East Mosul,” Al Monitor, February 15, 2017, www​.al​-mon​i​tor​.com/​p​u​l​s​e​/​o​r​i​g​i​n​a​l​s​/​2​0​1​7​/​0​2​/​m​o​s​u​l​-​i​r​a​q​-​k​h​a​z​i​r​-​h​a​s​s​a​n​-​s​h​a​m​-​d​i​s​p​l​a​c​e​d​.html. 30 RISE Foundation, Post-ISIS Mosul, 12. 31 The RISE foundation noted that some key informants alleged that former members of Shi’a PMF groups, from outside Ninewa governorate and still loyal to the Badr Organization, had joined the new police recruits, although it could not confirm these statements. Ibid., 13. 32 This figure is based on tracking conducted by the US Diplomatic Mission to Iraq and was shared with the members of the research study. 33 Not many TMF units were operating at a level where they could be deployed to other areas, according to those involved with them, but some of the older units had this capacity. 34 This information is based on tracking conducted by the US Diplomatic Mission to Iraq, and shared with the members of the research study. 35 Human Rights Watch, Iraq: Fallujah Abuses Test Control of Militias (New York: Human Rights Watch, 2016); Human Rights Watch, Iraq: Protecting Civilians Key to Mosul Battle (New York: Human Rights Watch, 2014). Khairuldeen Makhzoomi, ​“Trump and the Final Battle of Mosul,” The Huffington Post, March 3, 2017, http://​www​.huff​in​g​ton​post​.com/​e​n​t​r​y​/​t​r​u​m​p​-​a​n​d​-​t​h​e​-​f​i​n​a​l​-​b​a​t​t​l​e​-​o​f​-​m​o​s​u​l​_​u​s​_​5​8​b​9​b​4​8​9​e​4​b​0​2​b​8​b​5​8​4​dfb29; RISE Foundation, Post-ISIS Mosul, 17. 37 The RISE Foundation also reported, ​“Whilst PMF forces have not been directly involved in the fighting to retake Mosul from IS, many have begun to develop a presence in the city as security actors in retaken areas,” including manning checkpoints with other ISF forces. RISE Foundation, Post-ISIS Mosul, 17. 40 Renad Mansour, ​“After Mosul, Will Iraq’s Paramilitaries Set the State’s Agenda?” The Century Foundation, January 17, 2017, https://​tcf​.org/​c​o​n​t​e​n​t​/​r​e​p​o​r​t​/​m​o​s​u​l​-​w​i​l​l​-​i​r​a​q​s​-​p​a​r​a​m​i​l​i​t​a​r​i​e​s​-​s​e​t​-​s​t​a​t​e​s​-​a​g​enda/. 41 RISE Foundation, Post-ISIS Mosul, 19.